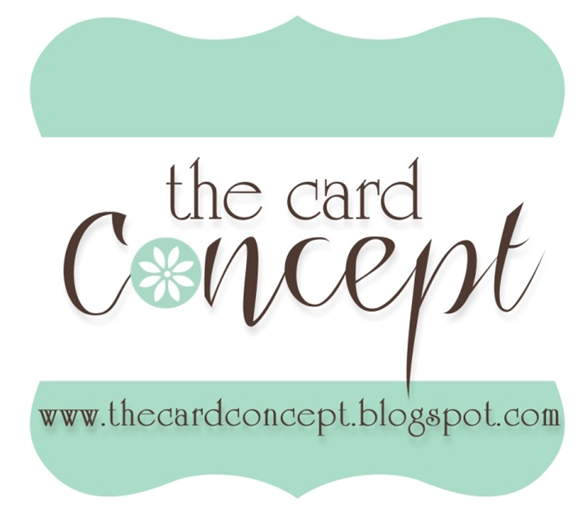 Studio L 3 GM 03: Exploring Tim Holtz Adirondack Color Wash! 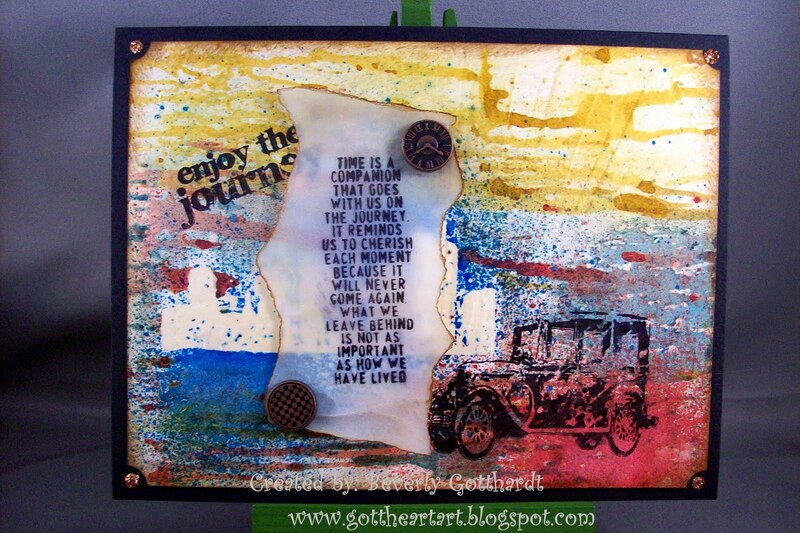 The Cheerful Stamp Pad Challenge #15-Are We There Yet? Grungy Monday at Studio L 3 is one of my new favorite places to play. This week we're playing with Adirondack Color Wash, so of course, I had to go on a little product hunt. A shout out to Scrapper's Boutique in N. Richland Hills, Tx., I wouldn't have been able to accomplish this project without their help. Wonderful store with wonderful people. Next, a shout out to 2 ladies with YouTube videos and techniques using this product. Sherry Cheever's Channel with the Faux Bleach Technique and oops, I missed getting this ladies name, but look her up at vienna-impressions.com with a brayer technique using these color washes. That's her web site, but she's on YouTube. 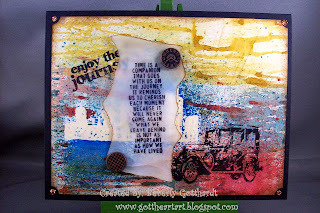 I'm also leaving a link Tim's web site, always a treat to visit: timholtz.com and the sponsor for Grungy Monday this week is Outlaw Women Scrapbook Emporium, lots of cool stuff there too. After these first 2 techniques I ran this through the Rays embossing folder, ticket punched the corners, inked the edges with Vintage Photo, stamped the sentiment and the car in black, on card stock vellum I stamped that sentiment in black, you have to be sure to get that ink very dry, tore it out, inked around the edges with Vintage Photo, attached it to the panel with brads, then to card front and finally did a small dot of copper stickles in each corner. I have to say if I had a million dollars that I could spend any way I wanted I would travel to every state in the U.S. that I could get to by car, and then add in Canada if there was any money left. Vermont has always been a dream trip of mine, so I would probably head that way first. My youngest son always had to be given a map with our route drawn out so he could see where we were at all times on the few trips we took when they were growing up, just so he wouldn't keep asking that dreaded question :-) Had to throw in a fond memory. Supplies: Black Card Blank 5" X 6 1/2" Halcraft, Papers: Inkssentials Manilla Card Stock, Stampin Up-card stock vellum, Stamps: Stampers Anonymous-Playful Journey, City Central, Ink: Ranger Archival Ink-Jet Black, Distress Inks-Vintage Photo, Scattered Straw, Embossing Ink, Utee, Adirondack Color Wash-Red Pepper, Butterscotch, Sailboat Blue, Sizzix-Rays embossing folder, BoBunny-brads, Stampin Up-ticket punch, Stickles-copper. A gorgeous card - the background is superb and all the elements work so well together. Gorgeous love the bright vibrant happy colours - where's my case!! Beautiful card Beverly!! Love the colours and yes, traveling would be high on my list too if I won a million dollars! Thanks for playing with us this week at Drunken Stampers!! Absolutely fantastic, the background is superb! Thank you for joining the Cheerful Stamp Pad challenge. I love the background! This is great. Thanks for joining "Are We There Yet?" at the Cheerful Stamp Pad. Beverly, this is a beautiful and incredibly creative work of art! What a great way to use the Color Wash sprays. The embossing is great, and the dreamy background is gorgeous. Nice touch with the stamped vellum and metal buttons. This is truly gorgeous and so unusual. I love it!